I've a 99 naturally aspirated volvo s70 with 109K miles. Currently the ETM light and check engine lights are on. It has very little power. If you give yourself some time it will eventually get to maybe 30-40mph. In park, the idle rhythmically surges between about 1100 rpm and about 1900 rpm. If you turn the ac on or put in gear, the idle does not surge but goes to around 1900. When driving, pushing the accelerator has little to no effect. A bit of history: the problem did not present itself all at once but got progressively worse over time and about the last 10K miles. Now it is constant. If I recall correctly, the etm light didn't come on until the problem got bad. I've done a little bit of google searching and suspect I need to send the etm to xemodex for rebuild but am not sure. I purchased a code scanner and multimeter this morning on the way to work. The sticker on the bottom of the etm is white. If you're mechanically inclined and good with a solder iron, I'd recommend the ETM repair kit from ARD Tuning. I did it on my '99 S80. Wasn't that hard and it's running terrific. Did a sweep test with VIDA/DICE to confirm my work. The best part is I saved over $300. Thanks guys. I'll look into the ARD kit as well. No definitions for the codes other than the one listed on the scanner. I erased the codes via scanner. two copies of P1026 and one of P1032 and P1053 remained. The ETS light went of. I cranked it up and drove it a block. All of the codes returned. It still ran poorly. The ETS light did not come back on but it may take multiple key cycles. Do these numbers tell you anything? I looked up the definition for the other codes at the innova site. Are these what you would expect associated with the ETM? Xemodex has suggested that I start by replacing the vvt solenoid and then move forward from there. I should have the part on Saturday. I will update after replaced. 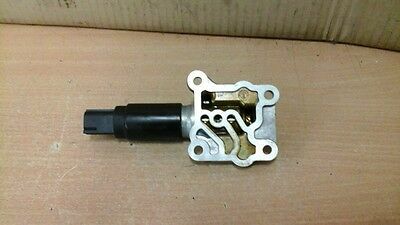 Has anyone had vvt solenoid issues? Well. What do you know...I pulled off the top section of the plastic cam cover by the cam gears and there is no vvt solenoid. So, the question is, why are some of the codes indicating a vvt issue? Does innova have the wrong definitions for the codes? If there's no VVT solenoid, then the computer will throw codes cus it can't read it. But the real question is, if you don't have a VVT solenoid, how is it not dumping oil all over the place? Someone put a cover plate on it? You are referring to this, right? I'm sorry I wasn't clear - it doesn't have vvt as it wasn't made with vvt. The code definitions in my code reader are incorrect. Once xemodex realized the code definitions I provided were wrong, they noted that many of my codes were common to etm failure. They provided me a flow chart for testing. If the electrical and vacuum testing is ok, then I will send the etm to them for repair. They've been very helpful. Finally getting back to this... Took the ETM off. I had to take the starter bracket off due to the size of the plug. Got my arms nice and cut up. Anyway the flap in the ETM is really notchy feeling when you open/close it and it doesn't necessarily spring itself back closed. Is this an indicator of a bad ETM? I've been told NOT to exercise the throttle plate on an ETM - could damage it. I dropped my ETM off at FedEx Tuesday at 3pm. It traveled to Canada, was tested, rebuilt and arrived back at my house in Mississippi on Friday. Wow! I put it in the car and it runs great now! Congrats! Glad you got it running! 99 v70 non-turbo - where is the ETM/throttle body?